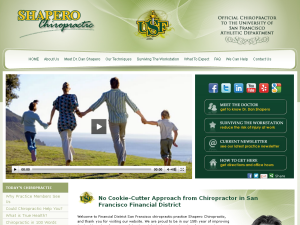 Life West Chiropractic College graduate serving San Francisco Financial District since 1998 offers Diversified, SOT, Thompson, Affordable Decompression, Extremities and Myofascial Release techniques. Northwestern Health Sciences University graduate serving Lakeville and Elko New Market since 1991 offers Diversified, Activator Methods® and Thompson adjusting techniques. Acupuncture, Massage Therapy, Physical Therapy, Nutrition and Homeopathy are also available. Palmer College of Chiropractic graduate serving Bonita Springs since 1986 offers Diversified, Activator Methods®, Thompson, Applied Kinesiology, Gonstead, Palmer Package and Cox Flexion-Distraction adjusting techniques. Acupuncture, Laser, Massage Therapy, Physical Therapy and Nutrtion Response Testing are also available.